I tricked my kids into eating black beans and fresh spinach for dinner. No joke. I layered a plate with tortilla chips, topped it with shredded spinach and black beans and loads of cheddar cheese. 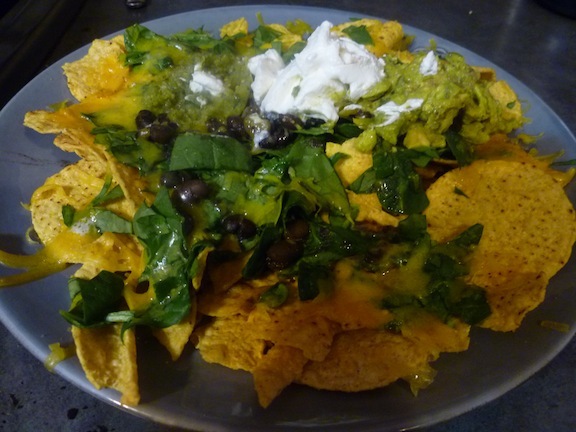 Once I popped that in the microwave, I added guacamole, sour cream and salsa verde. They ate the whole thing. Even the the spinach. Must be because it tasted just like Taco Bell. Er, uh, just like I imagine Taco Bell would taste like if I had eaten it every week in high school. Mix it all and mash it. Why does anyone ever buy this prepared? It’s so easy!